Plastic bags are just bad news all around. And paper bags are even worse (but we'll get to that). Worldwide, we consume between 500 billion and 1 trillion plastic bags annually. Americans use and trash around 100 billion plastic bags a year, which are produced by an estimated 12 million barrels of oil. Yes, plastic bags are made out of petroleum...that's right, oil! We all know the double-whammy problems with oil: Namely, the fact we are quickly running out of it, and that its usage emits CO2, which is a major cause of global warming. So, we can look at our unthinking use and disposal of plastic bags as just another manifestation of our addiction to oil. Get this: The manufacturing of just 14 plastic bags uses the same amount of oil as it takes to drive one mile!!! And with that come the same problems--global warming emissions and more dependency on the countries that control the dwindling amounts of oil left in the world (the exact countries we want to be extricating ourselves from). Have we forgotten that all paper products are made from trees? 15 million trees are cut down every year to supply our addiction to paper bags--around 10 billion a year. Again, there's a two-fold effect here: Trees help absorb greenhouse gases, but only if they are still alive! So by cutting so many trees down, we are simultaneously reducing our capacity to absorb CO2 and other greenhouse gases, then, of course, the elecricity used in the production of paper products emits more greenhouse gases!! On top of that, the production process of turning the tree pulp into paper (like all manufacturing) creates tons of toxic pollution that contaminates our air, land and water (which we end up breathing, eating, and drinking). Not convinced yet? Yes, the manufacturing of practically every modern convenience is problematic in terms of resources used and pollution created in production. But what makes plastic and paper bags worse than say, a plastic telephone and a wooden table, is that we get so little usage out of them compared with all the problems involved in their production. 1. BUY SEVERAL REUSABLE BAGS. My favorite site is www.reusablebags.com--lots of cheap and stylish choices--but there are many others out there, easily found. (Many grocery stores are also now selling their own reusable bags very inexpensively.) 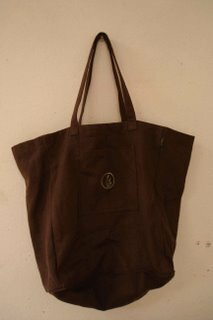 So far, my faves are the black acme totes because they are discreet and don't have that corny white tote-bag look. I've had mine for a week, and it's amazing how easy it's been to get in the habit of just keeping them with me, in case I need to stop by the store. If you already take your own bags every time you go to the store, there's always more you can do. My best find has been the produce bags on reusablebags.com. 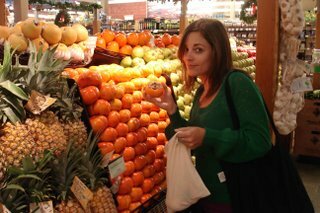 They're great, because those flimsy plastic produce bags have even fewer uses than the thicker ones given at checkout. This week, I used the produce bags at the market and once I got home, transferred the produce into some plastic bags that I already had. I can just keep reusing the same plastic bags for refrigerator storage, and use the cloth produce bags for new produce, so I don't have to keep accumulating more plastic ones. Also, as the holidays are approaching, these bags make great gifts! I'm convinced that once people have them around, they will get in the habit of using them (especially after you inform them of the evils of paper and plastic bags). And to all the guys who have expressed to me that they will look, um, unmanly taking their cloth bags to the store, I guess all I have to say is...get over it. We are adults. Real men bring their own bags. 2. FOR SINGLE OR SMALL ITEMS, REFUSE A BAG. Ok, I understand that even after you get set up with your reusable bags, the time may come when you run into the store for a single item and find yourself without them. You're buying a salad at lunch or a bottle of shampoo on the way home...Do you really need a bag for one or two items? No! Part of our job is also training the baggers to not automatically give people a bag for 1 small item. We might have forgotten how to, but we ARE able to carry things that don't come with a handle, after all. Same goes for double bagging...if you find yourself without your reusable bags, don't let them double bag! Even at a supposedly socially-conscious store like Trader Joe's, they automatically double bag. I have worked in grocery stores and I know this habit came about because customers end up complaining because the bag broke and their eggs cracked. So the stores want to preempt any whiney customers. But it is unnecessary and is yet another reason to BYOB...because reusable bags are not going to break! 3. USE YOUR REUSABLE BAGS FOR NON-FOOD PURCHASES TOO. Ok, so this may seem extreme to some of you, but it's just the logical extension of using resuable bags for groceries. Start thinking about all the other places you are given plastic bags...well, in every other store, too. And given our level of consumption, we all end up with a ton of Best Buy, Target, Gap, etc. bags. Guess what? You can take your reusable bags to those places too. Yes, the cashiers will look at you like you're crazy...but who cares, we're starting a trend! Last weekend, I did a little clothes shopping (at a totally un-socially conscious chain store that will go unnamed), and I put my purchases in my "shopping bag" (I do have a different one for non-grocery purchases, see pic at left), and I was good to go. It's funny, maybe this has happened to you: You're at a book store and you might have a purse or backpack with you anyway, and yet feel self-conscious about putting your purchase in your own bag...it is somehow more satisfying--perhaps the completion of the consumption process--to walk out with a fresh plastic bag advertising that, yes, you are a dutiful consumer. But I think it will be a lot more satisfying to to leave one plastic bag behind. 4. As for all those excess plastic and paper bags you have at home....REUSE, REUSE, REUSE...THEN RECYCLE. Some of us girls have a stash of beautiful, sturdy paper bags from department stores or boutiques. Yes, they are pretty...so reuse them until they fall apart. You can even take them back the next time you shop there...you'll be saving them money, which any locally-owned store will appreciate. Then recycle them. And next time, BYOB. But you say: I use my plastic bags as trash liners, or to clean up dog poop. I'm sure you will occasionally forget to bring your reusable bag and have to get a plastic bag, and if you have a use for them, you will be in no short supply. But a quick search found this product. As they put it: "Stop mummifying your dog's poop in plastic bags that won't biodegrade...now there's truly no reason to use plastic". I'm sure there are many other products out there, maybe even available at Whole Foods. I need to investigate biodegradable trash bags, but I think we've learned enough for one day. Phew. 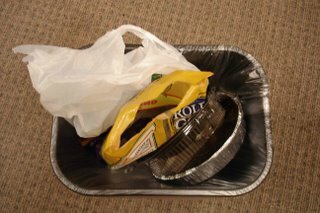 One last word on recycling bags: It's not the panacea we think it is. Read more here. If you already BYOB, please post tips or experiences you've had. For those of you who start, let me know how it's going! Please post a comment! Loved this post! Since college I've been a bag collector! James makes fun of me for all the bags of bags I have around the house but they work great for all the little trash cans in rooms of the house and if you need them for any other mode of transport. I'm gonna start bringing my own bags to my dept. and clothing stores, I just hope they don't throw me out for thinking I'm shoplifiting. Wow....a lot of info that I will be sure to read very soon. Love the photos. Decent reusable bags last. I've been using some canvas bags for over 15 years with no sign of them giving up. I don't know if all Trader Joe's do this, but my local Trader Joe's will enter you in a weekly drawing to win $25 worth of groceries if you BYO canvas bag to shop with. They sell their own TJ's brand bags for something like $2. Conservation + free groceries = total awesomeness! Thanks so much for the link about the biodegradable dog poop bags! What a great idea! I like your website and plan to read all your posts! I love using my own bags, but it's always so sad when you come across a person who has no clue. This happens to me at Target, where they sell their own reusable bags (yay) but employ teenagers who just don't get it. They either start looking for the price tag on the bag or hand it back to me when I say I brought it. I also hate when I say I want to use my own bag, so they take the plastic bagged item and put that bag into the canvas one. Arg! Then, if I return the plastic bag and say I don't need it, they throw it away! I made produce bags out of silk organza. They're see-through. There are flushable dog poop bags. The bag dissolves in water.